Rev. 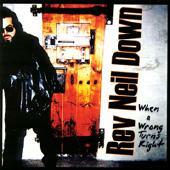 Neil Down's "When a Wrong Turns Right" is slow, folksy, Bob Dylan-like crap that most Rough Edge readers won't find listenable. The CD has strong lyrics and is very well produced. Still, it bored me to tears. I guess if you're looking for some thoughtful folk rock in the vein of Dylan or Van Morrison, there might be something about this CD you'll like. But the name of the CD says it all when it comes to Rough Edge: Someone took a wrong turn when they sent this to us for review. For more information, check out http://www.burnbarrelrecords.com.